An everyday, track ready car. 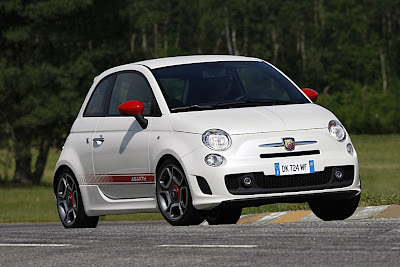 That is what Fiat calls the Fiat 500 Abarth. More than just a marketing gimmick, the metal has been tested. Somewhere in Europe right now, Abarths are racing from cone to cone, clipping apexes and taking checkered flags. After the fun, they will be driven back home, most likely flat out, on the autostradas, autoroutes and autobahns of Europe. In the video below, watch the Fiat 500 Abarth driver enjoy using his car on track day. On the 1.4L turbocharged engine, there is an after-run pump (4) located on the right inner fender, bolted to the front of the shock tower (1) . The after-run pump has an electrical connector (3) and two coolant hose connections (2). So, that noise you hear when you turn off your Fiat 500 Abarth is your friend, the after-run pump, keeping things nice and cool for your next run! *REMEMBER: The pump only turns on when certain thresholds have been met. It may not run every time you turn your car off. Can't get enough of the Fiat 500 Abarth and Catrinel Menghia? 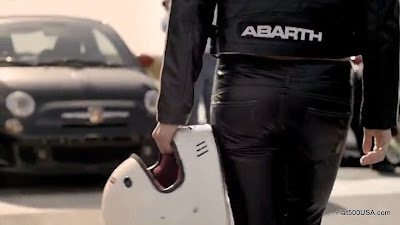 Here is a new Fiat 500 Abarth commercial featuring both. Enjoy! OK, you haven't bought a Fiat 500 Abarth yet, but you still want to experience what all the excitement is about. 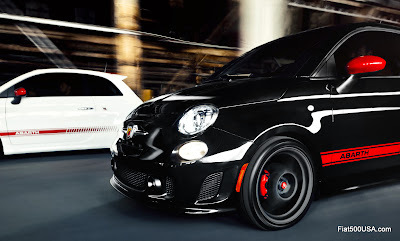 Well, here is your chance, because Fiat USA is holding a contest to give its Facebook fans a chance to win a Fiat 500 Abarth Driving Experience. Winning is easy, just follow the link below and vote for your favorite team. The team does all the work and you get to enjoy pounding a 500 Abarth on a racetrack nearest you! Sounds like a good deal, but don't waste time, the contest ends soon! 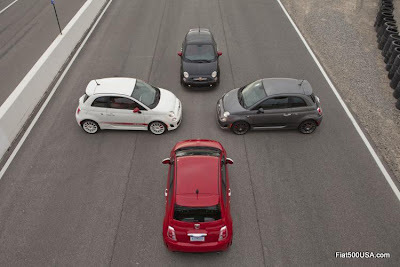 Auburn Hills, Mich. - To commemorate the first “Fiat 500 Abarth Driving Experience” the FIAT brand has selected five Facebook fans to participate at a special inauguration drive event taking place in Las Vegas on Thursday, April 26. The five Facebook participants will team up with five automotive bloggers, five lifestyle bloggers and five professional drivers in a series of driving challenges. 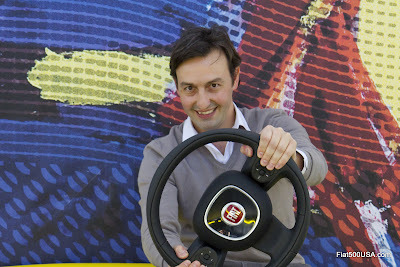 The teams will compete for a variety of trips and prizes on behalf of other Fiat Facebook fans (contestants) online. 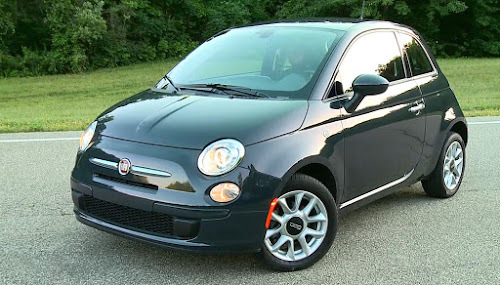 To enter, contestants can visit www.Facebook.com/FiatUSA and click on the “Drive for the Fans” tab. 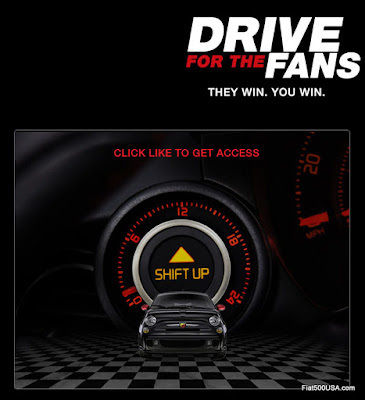 Fiat Facebook fans will be able to select their favorite team and enter for a chance to win a drive experience for themselves in one of six Fiat Abarth Driving Experience locations across the country. In addition to selecting their favorite team, the “Drive for the Fans” tab also will allow contestants to track the score for each team, learn more about track modules and view on-site video and photo coverage of the track experience. “Every Fiat 500 Abarth owner will have the opportunity to attend an ‘Abarth Driving Experience’ at six locations across the country throughout the year,” said Tim Kuniskis, Head of FIAT Brand for North America, Chrysler Group LLC. “We wanted to provide our loyal Facebook fans with a similar opportunity so they can enjoy first-hand the “small but wicked” spirit of our Fiat 500 Abarth while also enhancing their driving skills." Performance – A time-trial competition where the fastest driver wins. Drivers will put the knowledge from Driving Dynamics together with the inspired performance of the Fiat 500 Abarth. 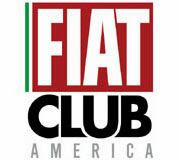 Go here to the FIAT USA Facebook site and vote for your team! 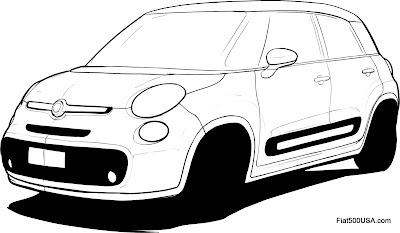 The Fiat 500L will bring advanced European small car design to America when it debuts next year. 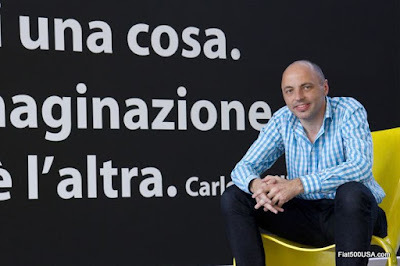 In this video, Roberto Giolito, head of Fiat and Abarth Design, lets you in behind the scenes of some of the concepts and thinking that went into the design of the new 2013 Fiat 500L. 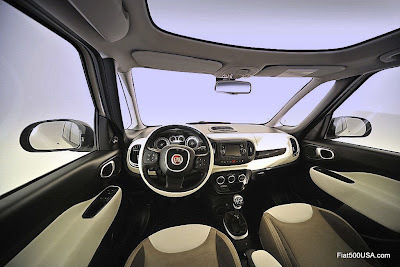 Fiat has released design details on the upcoming Fiat 500L, the new 5 passenger Multi-Purpose Vehicle that is coming to Fiat dealers in 2013. The Fiat 500L is the evolution of Fiat family car design that stretches back over 112 years. The 1912 Fiat Zero was to Italy what the Ford Model T was to America, except the Fiat was more advanced with a suspension and drivetrain that had more in common with the 1928 Ford Model A. Beginning with the original 1899 Fiat 4hp model and cars like the 1912 Tipo Zero, Fiat has always brought transportation to the masses showcasing intelligent and often ingenious automotive design. There are numerous examples. 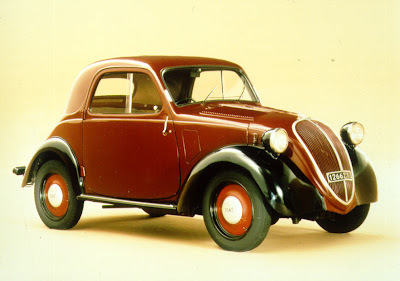 The 1936 Fiat 500 Topolino is considered the first modern small car. Created by legendary automotive design engineer Dante Giocosa, it was designed from the inside out and was a marvel of space utilization. 1956 Fiat 600 Multipla. 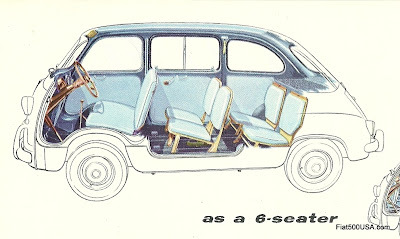 Three row seating for six passengers in a car the same size as a new Fiat 500. 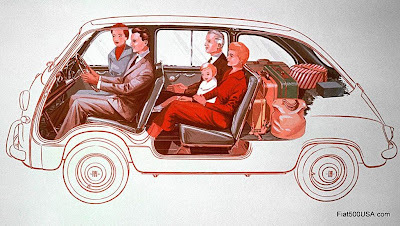 The 1956 Fiat 600 Multipla introduced Cab Forward design and was able to seat 6 passengers with luggage within a length of just 139 inches. 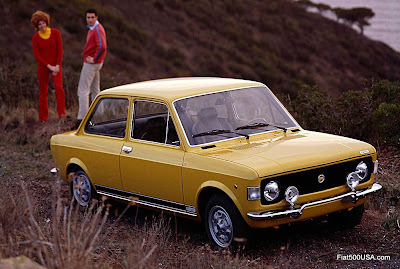 Then in 1969, a thoroughly modern small car turned the world upside down with the introduction of the Fiat 128. 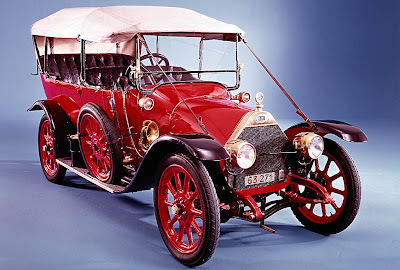 This acclaimed car had an overall length smaller than a VW Beetle, yet had more legroom than a Cadillac Eldorado. The front wheel drive car featured a transverse overhead cam engine, separate gearbox, electric cooling fan, rack and pinion steering and strut suspension. 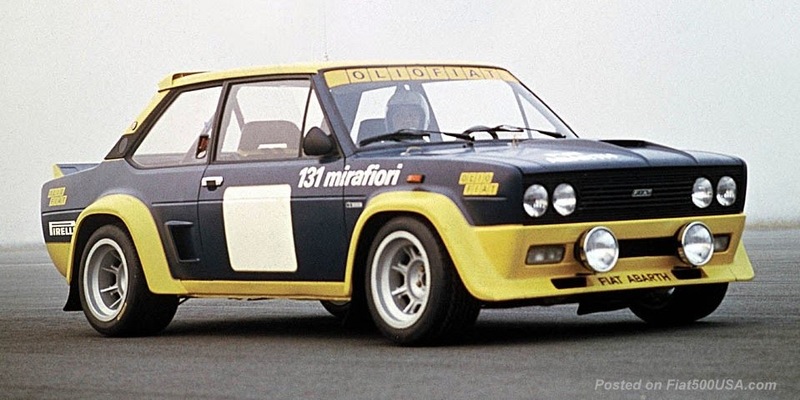 These specifications sound familiar today because the Fiat 128 pioneered and set the pattern for the modern front wheel drive car. Fiat's design leadership has continued throughout the successive decades: the 1980 Panda, 1984 Car of the Year Uno, the innovative 1998 Multipla and, of course, the 2007 Fiat 500 to name just a few award winners. 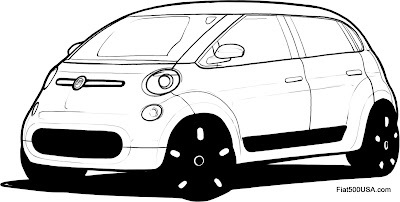 Now with the new Fiat 500L, we see the next step in Fiat design. The Fiat 500L advances the Multi-Purpose Vehicle concept with an expansion of room, versatility, convenience and personalization. To explain the concepts and goals the design team had when creating the 500L, Fiat has just published a book that tells its story. 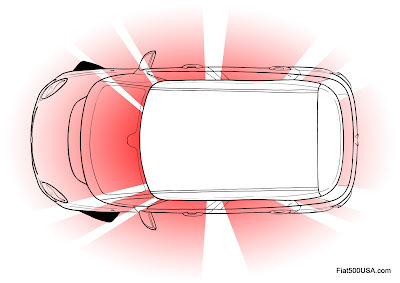 The following are excerpts taken from "500L, a Fiat Design Approach" that touch on some of the design points. The book is at the end of this post for your convenience. 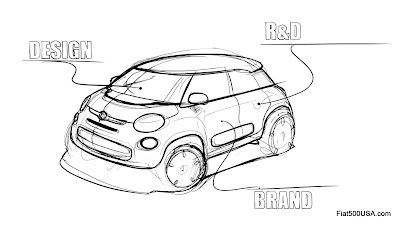 Can you tell us about the creative procedure that lead to the production of the 500L? What aspects represented the guidelines for the 500L project? When asked to develop a new model for the L segment, to which the so-called “leisure activity vehicles” belong, we immediately considered the loss of appeal of many products on the market and asked ourselves how we could give a large usable internal space and a bit of emotionality back to limited external size; something that belongs to our history and our technical capacity. Starting from the experience gained with the 500, we tried to transfer the same imagination to the new typology, accentuating however the concept of versatility. The objective was to define a line that would not undergo a rapid obsolescence, with a unique look and boldness of construction. 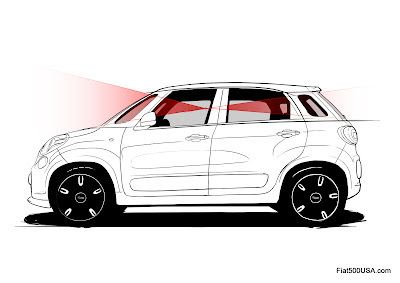 What are the features that characterize the 500L’s external design and what considerations inspired them? The 500L is characterized by continuous glazing, large apertures towards the outside and a highly liveableinternal space. The design of bodywork inspires a sensation of safety obtained through a high belt line, the accentuated shape of the wheel arches and a raised driving position. As a point of reference we did not, however, consider the SUV, which often has a negative connotation: grandeur, high consumption and almost shielding one from the outside. 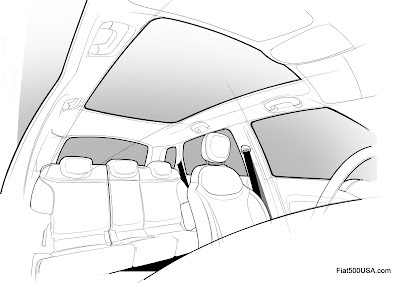 Here the process is the opposite; I feel protected inside the car but have a great view of the exterior; the clutter of the bodywork is reduced but the space available inside is maximized. 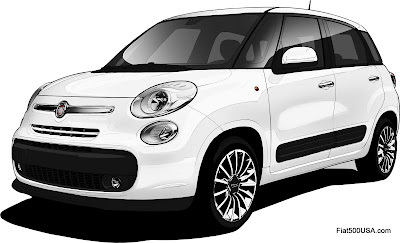 How does the 500L compare to other vehicles in the “L” segment when it comes to size? I believe that the 500L is primarily a highly functional car, capable of offering a surprising space for passengers and luggage in a little over four- metre length. However, this has a duplicate structural and with it formal reasoning: the 500L expresses its prerogative, but also a particular visual identity. We have tried to optimize the volumes that have a technical function to the advantage of liveability. At the same time we wanted to show a design “honesty”, excluding particular expedients that then, however, were not born out in the vehicle’s true prerogatives. The answer adopted in the design of the windscreen,with the split uprights, shows how one can obtain a fundamental requisite for safety and with it a coherent and original physiognomy. 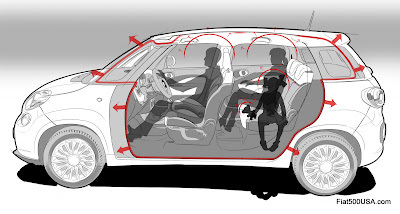 In conceptual and product definition terms, what solutions were adopted for the interior of the 500L? 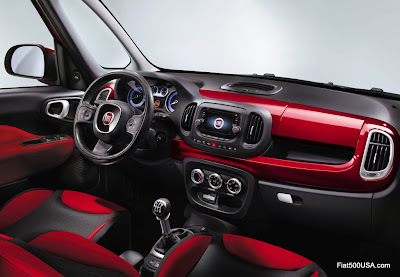 The basic principle was that of applying a logic to every feature, to every individual aspect regarding the 500L interior; a logic in the sense of ease of approach, interface, colloquialism, simplification, congruence and even humanity. The safety but also the pleasure given by the windscreen that allows a wide view, the raised position of the driver and passenger seats, the sensation of airiness, even if inside an automobile, hark back to an idea of harmony between the objects and the surrounding scenery. Specific attention was then paid to determining the shape of all the other features, from the dashboard to the door panels, from the design of the steering wheel to the smallest details, evocative of the vehicle’s physiognomy. The Fiat 500L is going to be an exciting edition to Fiat Studios when it arrives here next year. While you are waiting, make sure you check out the book below and you will see what I mean! Extensive coverage of the Fiat 500L. Everything you need to know is here! 2018 Fiat 500L Model Changes - See the differences. Yesterday, there was an opening ceremony in Serbia for Fiat’s most advanced car plant. 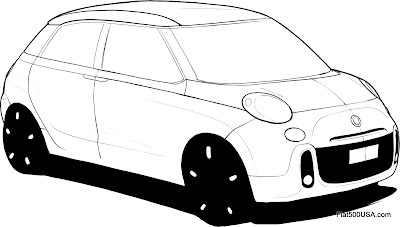 This factory will produce the new Fiat 500L, the larger 4 door MPV style vehicle Fiat will introduce here in the US for the 2013 model year. Mirko Cvetkovic, Prime Minister of the Republic of Serbia, together with Sergio Marchionne, CEO of Fiat SpA, inaugurated the new Fiat car production facility in Kragujevac. More than 150 guests from the political and business arenas attended the ceremony together with workers. In welcoming the Prime Minister, Fiat CEO Sergio Marchionne paid tribute to Serbia’s significant program of modernization which has created “a dynamic environment that is attractive to foreign investors. It is a great privilege for Fiat to be able to participate in the country’s future growth”. This opening represents the conclusion of three years of extensive and comprehensive work at the 1.4 million square meter site, which included improvements to the surrounding infrastructure, new roofing for the plant, new production shops, land remediation and the installation of world class machinery and production systems. A total of approximately $1.3 billion (€1 billion) has been invested at the site. The Kragujevac plant will produce the new Fiat 500L, which had its world premiere at the Geneva Motor Show this March. 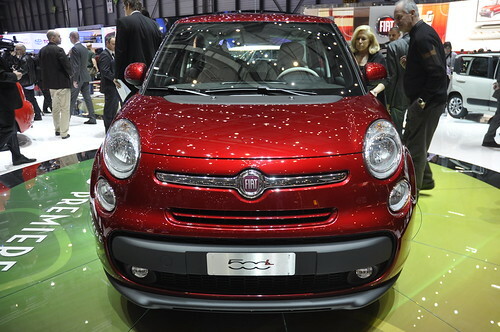 The 500L will be exported to markets in Europe and around the world with commercial launch planned for the last quarter of 2012. Pre-production Fiat 500Ls began being manufactured yesterday with serial production to begin at the end of May. By the end of the year, 30,000 units are expected to be shipped from the Montenegrin port city of Bar to markets abroad. The factory's output target next year is 160,000 cars. 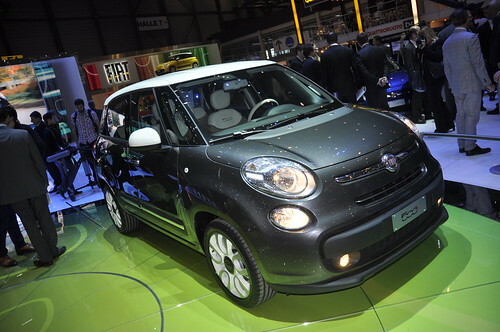 Price of the Fiat 500L in Europe is estimated at €16,000. By the end of 2012, some 2,400 people will be employed at the plant plus a further 1,000 with suppliers at the nearby supplier park. Once fully operational, the plant will have a production capacity of up to 200,000 cars per year. 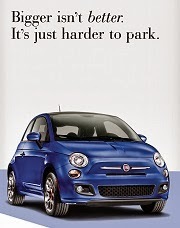 Fiat USA has recently sent Fiat Studios a new Fiat 500 Abarth brochure. The brochure is a beautiful 25 page booklet, and like the 500 Abarth, is destined to become much sought after. I suggest getting to a Fiat Studio to pick one up as soon as you can. While you are waiting, here is a view of the brochure for your enjoyment! 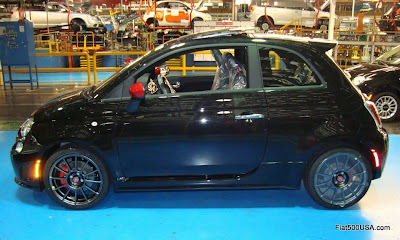 Earlier this month, Fiat began shipping production Fiat 500 Abarths to its Fiat Studios located across the country. The 500 Abarth has been hotly anticipated by waiting owners, some of which have put down deposits on the car over a year ago. Production at the Abarth's assembly plant in Toluca, Mexico has ramped up as it has been inundated with orders since the order banks officially opened on March 3. 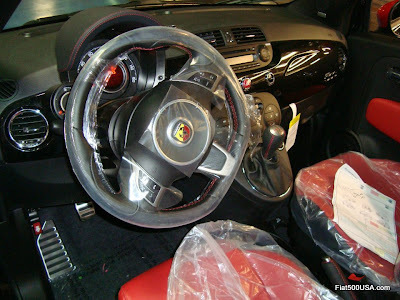 The huge demand for the limited production Fiat 500 Abarth has caused Fiat to re-evaluate production numbers for the car and has lead to some delays, most notably to cars with cloth interiors. 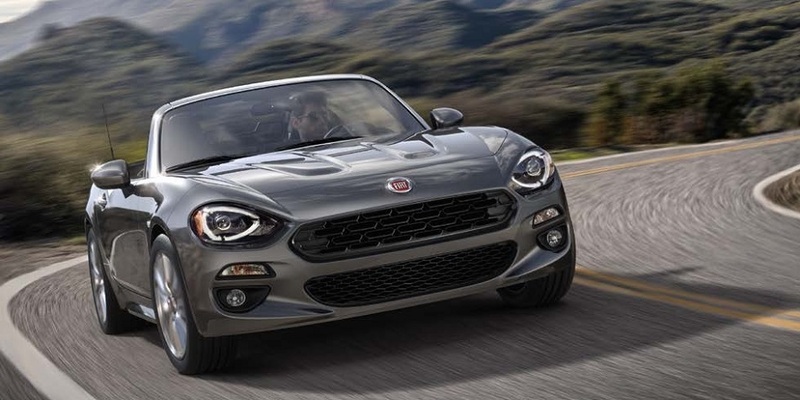 When you order a Fiat, the order first goes through various stages where materials and supplies are allocated, manufacturing logistics are worked out; the car is scheduled and a VIN is issued. This can take a week or more, especially if they are waiting for supplies. After the car recives a scheduled build date (D1 status), it normally takes approximately 2 weeks to go through manufacturing to get to the shipping phase. 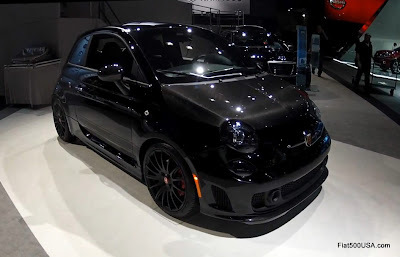 This is what happens during that 2 week time period: the 500 Abarth is filtered into the assembly line along with other Fiat 500s and Dodge Journeys produced at Toluca. Once on the production line, it takes approximately 16 process hours to make. Cars go through various quality checks, some are given an extended test drive (30 miles or so), then the cars are put in storage until it is their time to ship out. After the car is shipped out from the factory, depending on where it is going, it typically takes a few weeks to get to a distribution yard, where it is then loaded onto a car carrier for delivery to a Fiat Studio. For regular production cars, this whole process can take 6 to 12 weeks. However, it can be anticipated that limited production cars can take longer. Contact your Fiat Studio to get your VON (Vehicle Order Number) and track your car's progress online (read about that here). Keep in mind the Fiat online tracking site sometimes lags behind considerably. 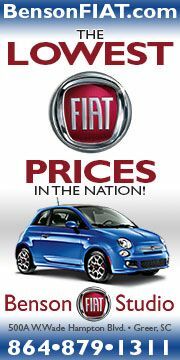 If this is the case, call Ciao Fiat (1-888-242-6342) to get the latest news. 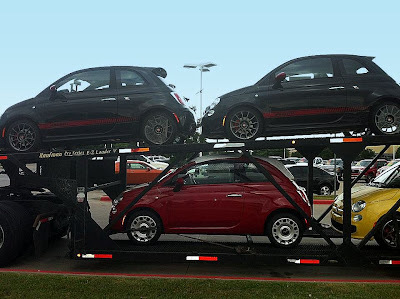 One of the first truckloads of new Fiat 500 Abarths were delivered Friday to Fiat of Austin, Texas. You can view the images on their Facebook page here. Other 500 Abarths are in transit, heading towards a dealer near you. Call the dealers below... April is Abarth month! One item that is sure to keep your attention in the new 2012 Fiat 500 Abarth is the turbo boost gauge prominently displayed to the left of the instrument panel. 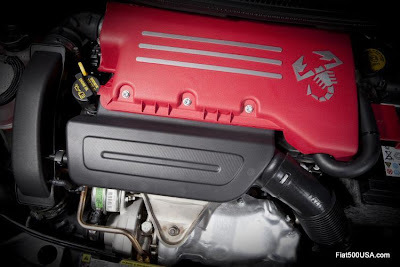 The engine management system in the Fiat 500 Abarth intelligently regulates turbo boost pressure based on environmental (ambient, elevation, etc.) and engine operating conditions. This way, folks living in high altitudes can experience the full 160 HP and 170 lbs-ft of torque the 1.4 L Turbo engine delivers. The turbo boost gauge indicates the intake manifold pressure (boost level) relative to barometric pressure. The turbocharger pressure reading on the boost gauge normally runs to 18 psi (1.2 bar) depending on the above condition requirements. The warning light in the boost gauge signals the ideal time to change gears. The gear change indication (arrow pointing upwards and words SHIFT UP) displays a suggestion to change up to a higher gear. With the ignition in the MAR (run) position, the gear change indicator lights up and goes out together with the instrument panel warning lights. 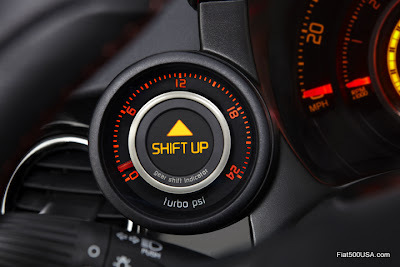 Afterwards, the up arrow and the words SHIFT UP light up each time there is a suggestion to change to a higher gear. Note: The light signalled provided by the instrument depends on the driving mode selected. With the SPORT mode on, the signalling is only activated at the maximum engine speed. With the NORMAL mode activated, the signalling is determined by the engine computer to achieve the best driving economy. 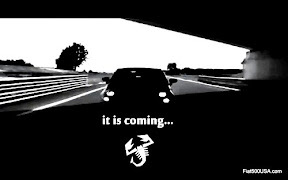 This is one feature that new Abarth owners will thoroughly enjoy! 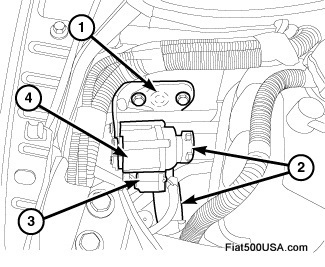 This information is based on the operation of the European 500 Abarth's boost gauge. The one in the US Fiat 500 Abarth is expected to operate similarly, but check your owners manual for any differences. Can't get enough of the Fiat 500 Abarth Venom concept car? Get your fix here with some images of the Abarth Venom at the 2012 New York Auto Show. Some of these shots have not been published (check out that exhaust!) so enjoy! Take a look at this video of the Fiat 500 Abarth Venom. There are some shots here of the trunk that haven't been seen. Please excuse the sound and the shaky camera.